Molly: Who dies while getting a massage? Much like many horror movie franchises that carry on to have a ridiculous number of sequels, the Final Destination series seemed to have passed the point of parody at this point; or at least so I thought. While I have been indifferent to the series that I refer to as Death’s Mouse Trap, as it tries its hardest to fit into the world of Rube Goldberg, I have to admit that I was surprised as to how much I appreciated this fourth sequel in the series. While still over the top in how elaborate the deaths in the film are presented, the film actually handles its tone with a level of seriousness that I could get behind, while reveling in some of its dark humor. Adding to that are some fresh ideas that help distinguish this film from its predecessors, not to mention its ingenious ending. While I am not suggesting everyone needs to race out and see it, Final Destination 5 should certainly please fans of the series and fans of mindless horror alike. As the film was shot in 3D (and works to the film’s benefit, as it has “over-the-top-why-not” logic applied throughout), Final Destination 5 begins with an opening credit sequence that supplies a barrage of deathly items plunging into glass, which almost undermines the tone of the rest of the movie. After this however, we are quickly introduced to the soon-to-be-murdered-in-elaborate-ways cast. In a slight change in place, these are actually a group of non-teenagers that work for a living at a non-descript company. I could name them all, but for now, I’ll just settle on three of them: Sam (Nicholas D’Agosto), Molly (Emma Bell), and Peter (Miles Fisher, who is a spitting image of young Tom Cruise). As the entire staff is headed for a company retreat, together on a bus, Sam has a vision that the upcoming bridge will collapse, causing the gruesome deaths of all his co-workers. Following this deadly premonition, Sam manages to get a few of his fellow employees (hey, it’s all the people we were already introduced to) off of the bus, before it collapses and many deaths ensue. As the survivors and a few others, including FBI Agent Block (Courtney B. Vance) are now concerned with how Sam came to know what would happen, Sam must deal with what he believes to be the sneaky form of death lurking every which way, in order to correct what has been done. 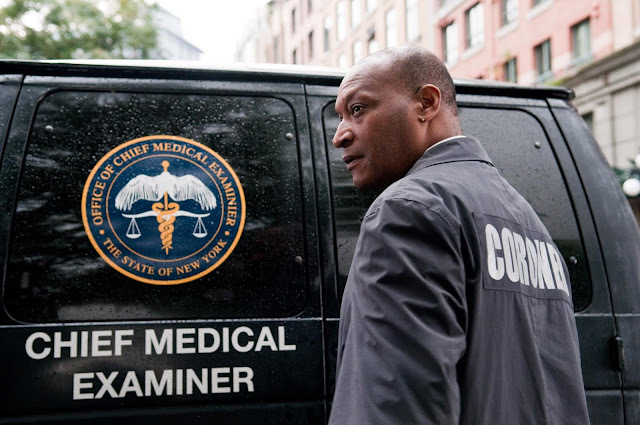 Sam and the others are made aware of the fact that they should not really be alive by the coroner, Bludworth (Tony Todd), who seems to understand that nature of death’s plan more than anyone else. Now it will be up to Sam and the gang to see about outrunning death’s plan, although no one seems to be safe, as these elaborate settings and circumstances seem to make everyone a target. The setup proves to be quite simple yet again; someone has a vision of death’s plan and manages to get a few people to avoid the trap. Death is pissed and has elaborate death traps setup in order to kill those who avoided their demise the first time around. I legitimately believed the first film in this series to be quite good. It was an original idea for a horror film that did not feel like it went too over-the-top with its premise. It was darkly funny in spots, sure, but the film had real characters who acknowledged the stakes of their situation quite reasonably. The sequels that followed only served to ramp up the level of ridiculousness involved in the elaborate death sequences. I can understand why that is fun for gore fans, but it still left the franchise in a state of silliness. Somehow, Final Destination 5 managed to bring things back to where the first film started. It still is silly, but it at least manages to make these characters somewhat interesting and they understand the deadly position that they are all in. I think there is something to be said about managing to create the proper tone for this type of movie, and director Steven Quale and screenwriter Eric Heisserer have managed to put the proper stamp on this film. It is not as if these characters are terribly complex (and half of them are actually very unlikable), but they approach their scenes in a way that is fitting for the film and overall entertaining. The story also manages to contain a fresh take on the “death’s plan” angle by bringing in the concept of killing someone else, in order to take that person’s life years for themselves. It is silly, of course, but it is a fresh idea that gives some new life to this installment. For a franchise with a simple and repetitive premise, I can appreciate the attempt to bring a new idea into the fold. Now obviously the deaths are a huge part of all this and as much as I can praise the level of craftsmanship from a character and story perspective, this entry in the series does deliver in terms of its level of gruesomeness as well. The bridge collapse at the beginning is of course a highlight, as it requires a large scale set piece to be demolished and features almost the entire cast. It is well crafted and has a lot of fun with the 3D. The rest of the deaths are well put together too, as far as the deaths in these kinds of movies go. I won’t spoil any in detail, but suffice it to say that acupuncture and laser eye surgery finally get their due here. I will also praise the ingenious ending of the film, which does an amazing job of bringing everything together and even recaps the deaths of the previous films (an actual reason to not just go to YouTube to see everything that way). I had no expectations for this film and it turned out to be just as good as the first film in the series, which is a very good thing. It is very silly, over-the-top, and eye-rolling, but it is also a lot of fun, creative, and fitting in its tone. Final Destination 5 knows exactly what kind of film it is, but it also does enough to make it a solid entry in its series. I don’t need to see another one of these films, but I could only hope that it inevitable sequel could match the quality of this one.